Are older people with cancer treated differently? Today is World Cancer Day. People care about cancer and our PHE public opinions survey showed that cancer is the public’s number one health concern. We are lucky in England to have excellent cancer services and to be seeing improving outcomes for cancer patients through diagnosing more people earlier and delivering more effective treatments. This is driven by work across the sector between many partners like the NHS, charities and government. PHE and our National Cancer Intelligence Network are central to supporting this, and improving people’s outcomes by using the vast information collected about cancer patients in England for analysis, publication and research. However, our data shows us that the needs of cancer patients are changing. Nearly two thirds of cancer diagnoses occur in the over 65s and one third in people aged 75, with over half of all cancer deaths occurring in people aged 75 and over. 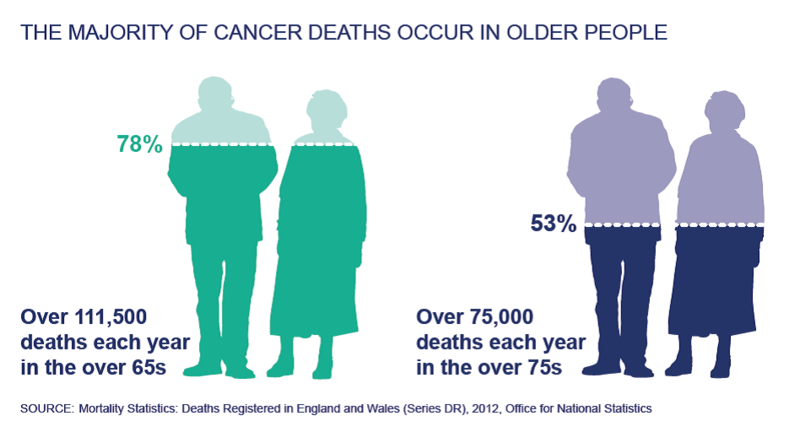 By 2020 there will be nearly two million people aged 65 and over with a cancer diagnosis. Indeed, we examined the impacts of cancer on older people in a report we jointly published in December with NHS England and others like MacMillan, Cancer Research UK, Incisive Health, Quality Health, Department of Health and the Geriatric Oncology Expert Reference Group. 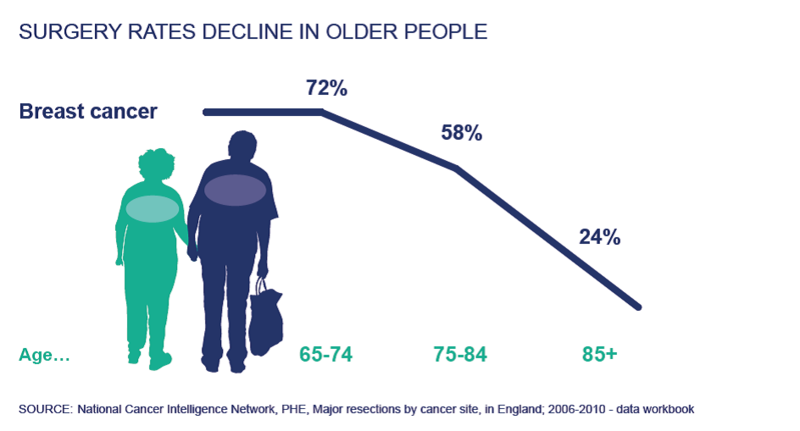 National Cancer Intelligence Network: older people and cancer summarises what we know about older people (those aged 65 and over) and cancer. It draws together information from different sources and studies and acts as a baseline on which our partners can act to improve cancer outcomes for older people. The report covers a wide range of issues and of course, not all older people are the same. Things like ethnicity, socio-economic background, type of cancer or the patient’s general health impact the way they are affected by the disease. The report does however highlight some important general points on the treatment of cancer in older people. Late diagnosis is a problem for older people and more needs to be done to encourage older people to recognise the signs and symptoms of cancer and seek appropriate help. Older people are more likely to be diagnosed following an emergency presentation at hospital, which usually means the cancer is more advanced and therefore harder to treat. Cancer survival decreases with increasing age, in particular for people over 70. Somewhat controversially, the report also shows that older patients are also less likely to receive active cancer treatment, be it surgery, radiotherapy or cancer drugs. In some cases, there will be good reasons for this, where frailty affects the effectiveness of treatment or treatment will have unacceptable impacts on quality of life. However, the NHS has stated that age should not be a barrier to treatment and the NCIN will continue to work with its partners to provide high quality information and analysis to ensure patients receive appropriate treatment. From a wider public health perspective, the evidence shows that there is more that older people could do to help reduce their risk of developing cancer, and also be fit for more aggressive (but more effective) cancer treatments by changing their lifestyle. It’s never too late for lifestyle change, but the earlier it starts, the better. The evidence suggests that more than 4 in 10 of all cancer cases in the UK each year could be prevented by lifestyle changes, with the key factors being smoking, alcohol (both less common in older people than the adult population overall), overweight and obesity, and physical inactivity (both more common in older people than the adult population overall). Information on how to take action and make positive changes to your lifestyle can be found at the Change4Life website. I have touched upon just some of the main issues outlined in the report. It sets out in detail what the evidence shows are the other major issues affecting older people with cancer, including the facts that older people are more likely to be satisfied with the treatment they receive, but less likely to be involved in cancer research. Age is just one of the areas of inequality that the NCIN looks at, but the report should form an excellent starting point from which the NCIN and importantly, our partners can help to improve the outcomes for older people with cancer. Have you found what I have highlighted interesting? Are there people you know who would benefit from seeing the report? Please feel free to share this blog and the report itself and expand the network of people who might benefit from our work. Improving health equality for gay, bisexual and other MSM – why now and how? What is a 'suspected' Ebola case?